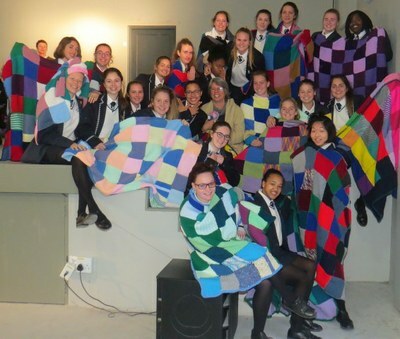 One of the most uplifting assemblies at Rhenish Girls’ High is the annual Blanket Assembly. This special assembly was held on Monday 15 August and it saw the culmination of the annual blanket drive that starts in April. Mrs Smart and Mrs Kruger start driving enthusiasm for this annual project (which started at Rhenish nearly ten years ago) at the start of the second term. The knitting keeps the fingers warm as the weather chills and it keeps minds distracted after exams. Girls who have not knitted before become hesitant and then consummate knitters and the squares begin to pile up in the register classrooms. Why squares, why blankets? The question is one that is raised each year – it would be cheaper and more time efficient to buy blankets at PEP and donate them. What the girls learn through the project – among other things – is that charity involves far more than putting your hand in your pocket. It is a true act of charity when you give not only of your possessions, but of yourself. A little bit of every Rhenisher and the extended Rhenish family that participates in this project goes into every one of the 210 blankets that Rhenish produced for donation this year. In the assembly on Monday, Mrs Kruger explained that knitting is actually a really good metaphor for life. We take the threads of our gifts, potential and circumstances and we knit them into the squares of our lives. What kind of lives do we knit? Are they lumpy, holey and more rectangular-ish or are they perfectly square, smooth and flawless? It is not necessarily true that smooth, flawless and perfect is the kind of square or life that we should be knitting. There are stories from around the world about deliberate mistakes introduced by craftspeople into their work, the idea being that a mistake is an aid to remaining humble by reinforcing that they and nobody, is perfect. “… in knitting, there isn’t a bad consequence to a mistake”. Mistakes are often opportunities to find a new use for something or a new design. With a few adjustments to your handiwork, like the mistakes that you make in your life, you come to see the mistake as part of the greater design of your life. It doesn’t matter how lumpy the knitting of your life is, it still makes a unique and beautiful pattern! Two worthy organisations – the Bluejay Fruit Farm after school care centre in Stellenbosch and Vision Africa’s school in Kayamandi – were the recipients of the Rhenish blankets and, by implication, the Rhenish love. As educational institutions, both organisations work very closely with the youth of our community and are committed to helping these learners to reach their potential and to achieve their goals. The appreciation for the Rhenish blankets expressed by the representatives warmed our hearts as the blankets will warm the recipients and reinforced Rhenish passion for this project.